Women go through many stages during pregnancy, and one of the most common is the “what the heck do I wear?” stage. Some people LOVE styling their bump, others dread it because they can’t figure out how to get clothes to fit right and feel comfortable. Me personally? I was a bit of both. I loved showing of of my bump but found it difficult to find clothes that fit well, partly because at 5’11 I’m quite tall. Regardless of your height, weight or shape, there are a few Maternity Fashion Essentials that will help you conquer the maternity wardrobe and help you feel comfortable & stylish. Consider these your go-to items and then mix & match with other great finds for the perfect maternity wardrobe. This post contains affiliate links, which do not cost you anything but help support the blog. See my disclosure page for more details. Let’s face it, we all try to squeeze into our pre-pregnancy pants and shorts, and often times, the waist is the only part that doesn’t fit. Enter the Belly Band. This this is GOLD to pregnant mamas. It allows you to wear your own clothes by securely holding up pants that have the buttons/zippers undone. And they stretch as your bump grows. As a bonus they look just like a layered tank when showing under shirts! I wore these all through my pregnancy, and recommend getting them in at least 2 colors (white & black). Soft, comfortable and virtually endless ways to style them, leggings are a must for any maternity wardrobe. The stretch belly band provides a good amount of support for your bump, and also helps to smooth thing out. I loved wearing them under long shirts, dresses during summer, or sweaters in the fall. I continued to wear them long after delivery as well as they provided great belly support when things didn’t quite go back to normal for a while! Compression leggings like these are also great for pregnancy, as they help reduce swelling and boost circulation. If full length leggings seem to hot, try out a capri style legging instead. A comfy maternity tank is a must have—perfect for hot summer days or layering under any type of top, these tanks often feature rouching on the sides to ensure a great fit as your bump grows, and are typically longer than most tanks to avoid the constant pulling down of regular tank tops. Dresses are perfect for pregnancy. When everything (and I mean EVERYTHING) is stretching, it is nice to be able to slip into a something that is free flowing and not constrictive. Empire waists like this dress are perfect for accommodating a bump, and a simple form fitting tank dress like this one is great year round, as it can be dressed up or down, mixed with cardigans or have a shirt thrown over for a changing look. Pregnancy side effects sometimes make us feel, let’s face it, fairly gross at times. But putting on a pair of skinny jeans had the power to boost my self-confidence when I was feeling more like a beached whale than a glowing mom-to-be. While you can use the belly band on your own pair, I highly recommend getting a good pair of maternity skinny jeans. They are shaped perfectly for the the second half of pregnancy and the attached belly band smoothes things out much easier. A common pregnancy complaint is sore breasts, and that continues well after delivery as well for many (especially those breastfeeding). Wearing a lightweight sleep bra is actually really important for relieving discomfort, providing adequate support to growing breasts, and preventing complications while nursing. Find a few comfortable ones that will work for middle of the night nursing sessions later like these maternity/ nursing bras. Almost 2 years later I still wear mine when I don’t feel like putting a real bra on around the house! Cardigans are the best invention for soon-to-be mamas. Going from hot to cold to hot again, plus trying to find outerwear that fits over an ever-changing bump is frustrating. But cardigans make it easy and look great to show off a bump (especially ones that hit a little lower than the waist). The great part about cardigans is you don’t necessarily need to buy a maternity one—any one will do. This one is under $15 too, so you can feel good buying them in every color like I do! As tempting as it is to wear flip flops everyday, wearing proper footwear helps cut down on some of aches and pains associated with carrying pregnancy weight around (and helps with balance!). Plus it is important to get enough exercise in daily. Sneakers are great then, but the last thing you want to do when you are 9 months pregnant is reach down and tie your shoes. Get a good pair of slip on sneakers that will go with anything, and never bend down to tie your shoe again! With these 7 pieces, you will be on the right track for creating comfortable and stylish maternity outfits. Have fun pairing some of your regular clothing with them too, as you will be surprised how much of your closet still fits during pregnancy! 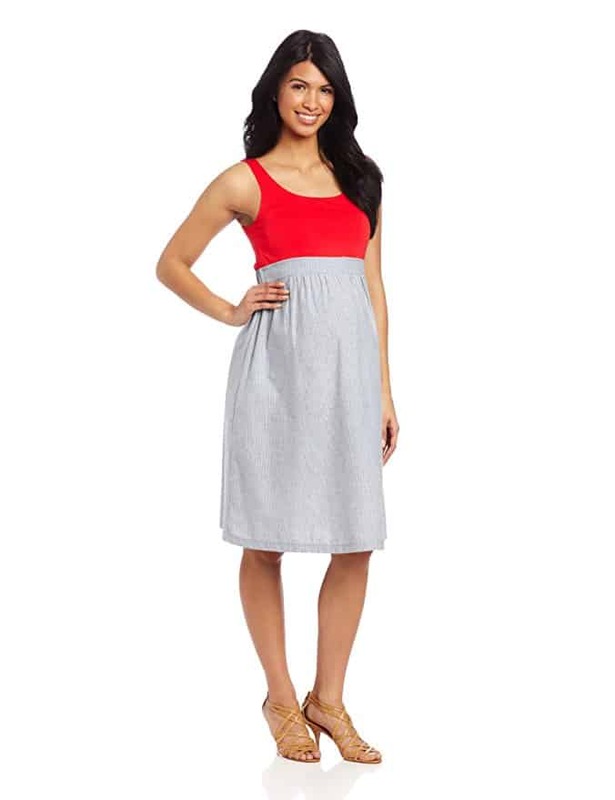 What are your maternity fashion essentials? Let me know below! Hi! I’m Mary, mama to 2 little girls and a mom friend to others on this awesome (and often overwhelming) journey of motherhood. Explore the site for tips and ideas for life and travel with littles!